Up to the seventeenth century this word was spelled in Middle English in various ways: "Gyu," "Giu," "Gyw," "Iu," "luu," "Iuw," "Ieu," "Ieuu," "Ieuz," "Iwe," "Iow," "Iewe," "Ieue," "lue" ("Ive"), "Iew," "Jew." All these forms were derived from the Old French "Giu," which was earlier written "Juieu," derived from the Latin accusative "Judæum" with the elision of the letter "d." The Latin form "Judæus" was derived from the Greek 'Iουδαĩοσ; and this in turn from the Aramaic , corresponding to the Hebrew a gentilic adjective from the proper name "Judah," seemingly never applied to members of the tribe, however, but to members of the nationality inhabiting the south of Palestine (Jer. xliii. 9). It appears to have been afterward extended to apply to Israelites (II Kings xvi. 3) in the north. The English word is met with in the plural form as early as 1175, in the Lambert "Homilies"; in earlier English the form "Iudea," derived from the place-name "Iudea," is found in the Anglo-Saxon Gospels (John xviii. 35) of about the year 1000. Ormin, about 1200, uses the form "Judeow," derived from Old High German "Judeo," from which the modern German "Jude" is also derived. In the Old Testament the term "Jew" appears to be applied to adherents of the worship of Yhwh as conducted at Jerusalem after the Exile: it is thus used in the late Book of Esther. In more modern usage the word is often applied to any person of the Hebrew race, apart from his religious creed. 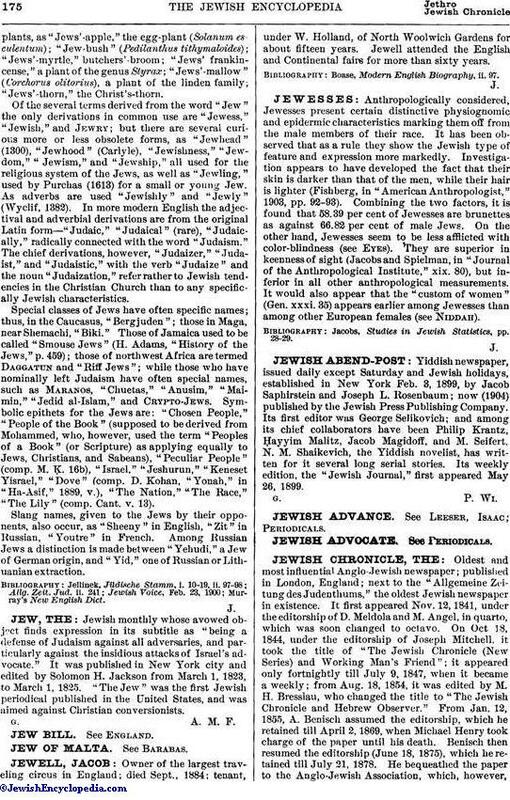 At one time during the emancipation era there was a tendency among Jews to avoid the application of the term to themselves; and from 1860 onward the words "Hebrew" and "Israelite" were employed to represent persons of Jewish faith and race, as in the titles "Alliance Israélite Universelle" and "United Hebrew Charities." At the present time the name "Jew" is being more commonly employed. The word is sometimes used as an adjective, as in "Jew Bill," "Jew boy," etc. 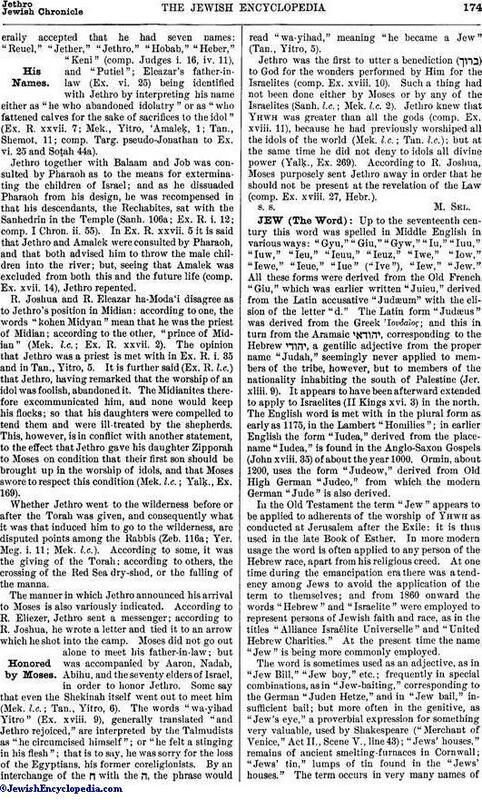 ; frequently in special combinations, as in "Jew-baiting," corresponding to the German "Juden Hetze," and in "Jew bail," insufficient bail; but more often in the genitive, as "Jew's eye," a proverbial expression for something very valuable, used by Shakespeare ("Merchant of Venice," Act II., Scene V., line 43); "Jews' houses," remains of ancient smelting-furnaces in Cornwall; "Jews' tin," lumps of tin found in the "Jews' houses." The term occurs in very many names ofplants, as "Jews'-apple," the egg-plant (Solanum esculentum); "Jew-bush" (Pedilanthus tithymaloides); "Jews'-myrtle," butchers'-broom; "Jews' frankincense," a plant of the genus Styrax; "Jews'-mallow" (Corchorus olitorius), a plant of the linden family; "Jews'-thorn," the Christ's-thorn. Of the several terms derived from the word "Jew" the only derivations in common use are "Jewess," "Jewish," and Jewry; but there are several curious more or less obsolete forms, as "Jewhead" (1300), "Jewhood" (Carlyle), "Jewishness," "Jewdom," "Jewism," and "Jewship," all used for the religious system of the Jews, as well as "Jewling," used by Purchas (1613) for a small or young Jew. As adverbs are used "Jewishly" and "Jewly" (Wyclif, 1382). In more modern English the adjectival and adverbial derivations are from the original Latin form—"Judaic," "Judaical" (rare), "Judaically," radically connected with the word "Judaism." The chief derivations, however, "Judaizer," "Judaist," and "Judaistic," with the verb "Judaize," and the noun "Judaization," refer rather to Jewish tendencies in the Christian Church than to any specifically Jewish characteristics. Special classes of Jews have often specific names; thus, in the Caucasus, Bergjuden"; those in Maga, near Shemachi, "Biki." Those of Jamaica used to be called "Smouse Jews" (H. Adams, "History of the Jews," p. 459); those of northwest Africa are termed Daggatun and "Riff Jews"; while those who have nominally left Judaism have often special names, such as Maranos, "Chuetas," "Anusim," "Maimin," "Jedid al-Islam," and Crypto-Jews. Symbolic epithets for the Jews are: "Chosen People," "People of the Book" (supposed to be derived from Mohammed, who, however, used the term "Peoples of a Book" (or Scripture) as applying equally to Jews, Christians, and Sabeans), "Peculiar People" (comp. M. Ḳ. 16b), "Israel," "Jeshurun," "Keneset Yisrael," "Dove" (comp. D. Kohan, "Yonah," in "Ha-Asif," 1889, v.), "The Nation," "The Race," "The Lily" (comp. Cant. v. 13). Slang names, given to the Jews by their opponents, also occur, as "Sheeny" in English, "Zit" in Russian, "Youtre" in French. Among Russian Jews a distinction is made between "Yehudi," a Jew of German origin, and "Yid," one of Russian or Lithuanian extraction.